Tax Foundation: National Tax Freedom Day 2019 arrives April 16. In Washington, it shows up four days later, April 20. The Tax Foundation has announced that Tax Freedom Day for 2019 arrives nationally April 16. The annual announcement is often watched closely as an easily understood measure of tax burden. Here’s how the Tax Foundation describes it. 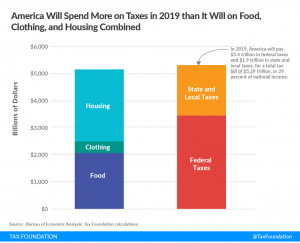 Of course, state and local burdens vary among locales, so the Tax Foundation also provides an estimate by state. 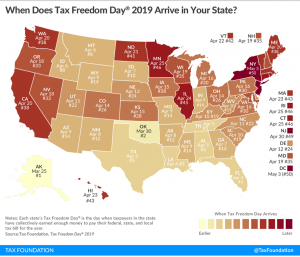 As the map below shows, Washington ranks among the states with a heavier tax burden, with Tax Freedom Day arriving here April 20, four days after the national date. The Tax Foundation explains the reasoning. Washington is a high income state, with taxpayers who pay relatively higher taxes under the progressive federal income tax structure. As the Washington Research Council has explained, fiscal federalism recognizes the interplay among federal, state and local taxes. 3. All state and local tax structures are regressive. But when the steeply progressive federal income tax system is considered, the overall federal-state-local tax burden is progressive in Washington and every other state, and the differences among thestates represent smaller proportions of households’ tax burdens. Earlier, the Tax Foundation reported that one-third of those filing tax returns have zero income tax liability; the top 1 percent pay 37.3 percent. As the chart below, from the Tax Freedom Day announcement, shows, federal income taxes far overshadow state and local taxes in calculations of the overall tax burden. With lawmakers spending a lot of time in the next few weeks considering changes in the state tax structure, clearing up misconceptions regarding the way the current system works should be a priority. Among the things to remember: Washington’s tax structure is relatively stable, has produced substantial revenue growth since the recession, and has nurtured a vibrant private sector economy. And, for those for whom it’s a concern, as the late Tax Freedom Day demonstrates, high income taxpayers in Washington pay considerable federal income taxes.